Fernando Belaunde-Terry was born in Lima, October 7th 1912. He started his education in his home town, completed high school in Paris and then, went to college in Miami. In 1935, after graduating as an Architect from the School of Architecture of the University of Texas in Austin, he moved to México City, where his father was the peruvian ambassador. After almost 15 years in exile, Dr. Rafael Belaunde had accepted the diplomatic post from General Benavides, who had sworn in as President after being elected by Congress, in the aftermath of a prolongued period of unrest that followed the violence of the early nineteen thirties. FBT initiated his professional practice in the mexican capital in association with mexican architects. In those years the Revolution (started in 1911) was stabilizing. The sheer violence of the initial years had gradually evolved into a very interesting sociological phenomen which gravitated both in the cultural world and in the public mood: a deep feeling of pride for the indigenous roots of the mexican tradition seemed intensely alive. Two factors, a prominent intellectual and writer, Jose de Vasconcelos, who had been Secretary of Education a few years before, and the revolutionary mythology had created a widely spread nationalistic sentiment. Those were years of optimism and enthusiasm for large sectors of the mexican society. A strong feeling of self esteem and infinite power mingled with the colorful dramatism of mural paintings and the engaging euphoria of popular music. Undoubtedly a stimulating time and scenery for someone who was starting an architectural career. Back in Lima, in 1936, he found himself sharing tasks with a handful of professionals, mostly prepared abroad. The challenge seemed very clear: it was necessary to create the conditions for a virtually unknown profession to be appreciated and recognised. The small group of peruvian architects was very distinguished and talented. Nevertheless, most of the projects of the time were directly or indirectly imported and european styles and fashions were preferred by the potential client-public. IIn the west coast of the USA, a new architectural expression consolidated it's influence. Usually known as "californian", it's formal characteristics were inspired by the "franciscan" mission convents scattered throughout California. An architecture expression originated in the south of Spain, it´s simple elements looked well under the strong Californian sun and some of it's romantic details (such as balconies, arches, and thick masonry walls), coincided with the colonial tradition of most of South America and particularly Peru, the coastal region of whose territory strongly resembled that of California. Probably due to these coincidences, Belaunde-Terry showed in his early work, a notable influence of the "Californian" style. This influence extended to other peruvian architects of the time. They became quite successful in their own interpretation of "Californian" architecture, later re-baptized as the "Andean" style. Among the most notable followers of such tendency were architects Enrique Seoane Ros and Augusto Benavides. Some of the Belaunde-Terry houses of this period are still visible in San Felipe avenue, in near by streets and in Miraflores. 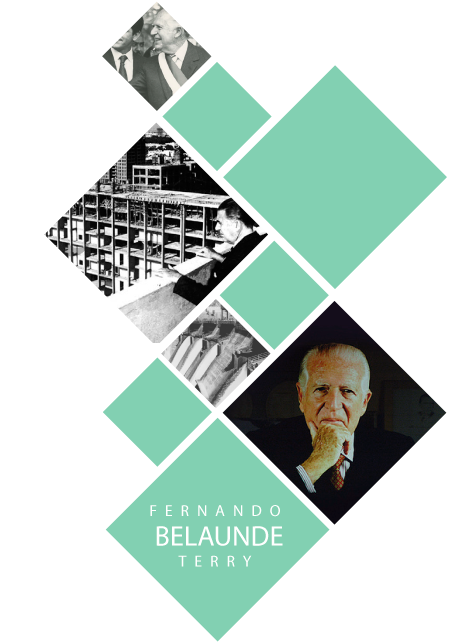 In August 1937 he started El Arquitecto Peruano, a magazine destined to introduce and make known the new possibilities and ideas regarding architecture, urban and interior design. He directed the magazine for 26 years, until July of 1963 when he swore in as President of Peru for the first time. Cristóbal de Losada y Puga, at the time, Dean of the Engineering School of the Catholic University, called him as an Urban Design teacher in the early years. Thus he started his experience in teaching and discovered a passion for it. He dedicated a very important part of his time to this endeavor. Later on, he joined the Architecture Department in the National Engineering University (UNI). A short time afterwards, he was named Director of the Department (within the School of Engineering) and later he transfomed it into an independent School. Teaching became an outstanding way of expanding his knowledge of Peru and it's needs. He would direct his engineering students, mainly when they were preparing their Graduation Project, to the study of infrastructural problems related with the development of the productive potentials of the country. He would make use of the provincial origin of most of his students to orient them towards projects (roads, bridges, ports, dams, etc) that might better the conditions of their home towns. The product of this long sustained effort was a valuable "dossier" of possible projects for the development of Peru. The experience enabled him to deepen his knowledge of the needs and the potentials of an underdeveloped country such as ours. Later on, they became a sustantial part of his political program. Antonio Zapata, a meticulous historian, has written an interesting book called: "Young Belaunde". The main thesis being that El Arquitecto Peruano was his principal instrument to explore and anticipate his own destiny. Undoubtedly an interesting insight, it would be incomplete if it did not consider the fact that the investigations and proposals done by his students, year after year, provided the field experience which complemented the hipothesis that the magazine published and condensed. Together they were the different pieces that articulated one sole purpose. Like in the nutritional industry, in one side the lab explored for new options, in the other, the promotional area would sample the finished product and ponder it's viability and acceptability. In the process, some of those new products became a promise, at first, a possibility, later on, and finally a "must have". In the School of Architecture he taught "PNV" (the abbreviation, probably echoes the first FDR campaign, which happened during his early Texan years. The "New Deal" packaged a number of programs identified by their initials, such as AAA, WPA, NRA, etc). PNV stood for "Problema Nacional de la Vivienda" (National Housing Problem). It was a synthetic presentation of the most advanced concepts regarding Urban Design and Housing, mostly originated in Great Britain. Among them, the concept of "Garden Cities" by Ebenezer Howard was particularly relevant. It was clear that he strongly appreciated this idea that inspired most of his housing projects, starting with the "neighbor units" of 1947 up to the "Santa Rosa citadel" of 1984, they show the firmness of his conviction in favor of this very seductive alternative. In 1945 he participated in an election for the first time. He became a congressman with the second highest number of votes. Then he was an independent member of the "Democratic Front", a coalition of popular parties and independent groups that backed the election of Dr. José Luis Bustamante y Rivero for the presidency. As a congressman he specialized (and introduced basic legislation) regarding urban planning, housing policies and horizontal property in Peru. After a three year term, Peru was looked at as South America's most advanced country regarding housing policies. In 1956 he ran for the presidency for the first time. Even though his candidacy was decided a short period before the election, he was a radical opposition candidate and had no polítical party backing, he ended up in second place, a very short distance away from the winner. He tried again three more times: in 1962 (a process that was interrupted by a military coup), in 1963 (he won for the first time) and 1980 (he won for a second period). Altogether, he governed Peru for ten years, two months and four days. His political dedication obliged him to back off from architectural practice. It was a big loss for the professión and a big gain for Peru. He dignified political life, redirected the attention of people towards the forgotten villages and convincingly preached appreciation for the ancient traditions of our outstanding culture. With his dedication to public service, architecture lost one of it's most valuable members and promotors. Of the 46 years he gave to public service, he spent 10 in government, 10 in exile (as a teacher in US universities). The other 26 years, a period similar to the one he spent directing El Arquitecto Peruano, he spent "campaigning". Being "in campaign" meant moving about Peru visiting, one by one, every little village. The purpose of such intensive travelling was to encourage citizens (specially the young) to feel pride for their history, confidence in their own traditions and faith in their capacity to provide for their own needs. During his youth he had contributed to the creation of the Peruvian Society of Architects; he had started, together with Luis Dorich and Luis Ortiz de Zevallos, the teaching of Urban Design and Planning in Perú; he had made possible the building of the first School of Architecture with money given by private donators and hand work provided by professors and students; he had created the Instituto de Planeamiento de Lima, (Lima Planning Institute), an interamerican post graduate school, backed by the OAS and Yale University, which received students from all of Latin America; as a member of Congress, he had been instrumental in the creation of the Corporación Nacional de la Vivienda (National Housing Corporation) and ONPU (National Planning and Urban Design Office); he had dreamt with architecture as the profession that would lead the future development of Peru. Many of us became contaminated with his dream. Those were the years of highest intensity. Now that he is gone we are left with the memory of his warmth, of the abundance of his ideas and his deeds, of his beautiful and stimulating words, of his enthusiasm that came from a mysterious source, of his permanent unrest that seemed to come from a deep conviction: "there is no time to waste: life goes on very rapidly and it will not leave us enough chances for all we can serve." He passed away in Lima on June 4th 2002, four months prior to his 90th birthday.